So the New York Times reported last week that the Pacific salmon fishery, long endangered, will probably be closed from northern Oregon to the Mexican border. Why? Because there just ain't enough fish in the sea. The Alaska and Washington fisheries will remain open. Nevertheless, the Times stated, the Oregon and California closure would be "the most extensive closing on the West Coast since the federal government started regulating fisheries." A National Marine Fisheries Service employee concurred, saying, "This is the largest collapse of salmon stocks in 40 years." Along with long-term overfishing, the crash in the salmon population is likely linked to abnormal ocean conditions in recent years, such as the oxygen-deprived "dead zones" that have been appearing lately in the Pacific Ocean off the West Coast. All of which makes Saveur magazine's recent essay about fish seem poorly timed, to say the least. (The essay, by Francis Percival, isn't available online.) Yes, the essay is a thoughtfully written bit of musing about how the English language doesn't have good terms for describing the taste of fish. But when there isn't any fish to buy, why worry? bq. Red snapper has sweet, nutty-tasting flesh and tastes wonderful pan-roasted, making it highly sought after. Scarcity due to overfishing has tempted some fishmongers to practice deception: a 2004 University of North Carolina study showed that 75 percent of all fish labeled red snapper in markets is not in fact red snapper but, often, blackfin snapper or Pacific rockfish. 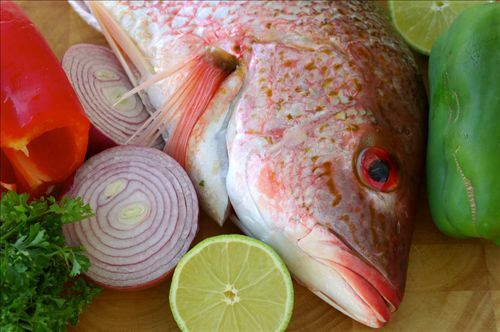 To be sure of what you're getting, check the eyes: a real red snapper has bright red irises. Unless you're too busy seeing red, that is.